1. Read the article, “A New Tool to Assess Risk of Wandering in Hospitalized Patients” found on pages 28–33, carefully noting any tables and other illustrative materials that are included to enhance your knowledge and understanding of the content. Be sure to keep track of the amount of time (number of minutes) you spend reading the article and completing the quiz. 2. Read and answer each question on the quiz. After completing all of the questions, compare your answers to those provided within this issue. If you have incorrect answers, return to the article for further study. 3. Go to the Villanova website listed above to register for contact hour credit. You will be asked to provide your name; contact information; and a VISA, MasterCard, or Discover card number for payment of the $20.00 fee. Once you complete the online evaluation, a certificate will be automatically generated. This activity is valid for continuing education credit until February 29, 2016. Villanova University College of Nursing is accredited as a provider of continuing nursing education by the American Nurses Credentialing Center’s Commission on Accreditation. 1. Identify at-risk factors to prevent wandering of hospitalized patients. 2. Review interventions to reduce risk for wandering in at-risk hospitalized patients. Dr. Sheth is Research Assistant Professor, Division of Quality and Safety, Department of Medicine, School of Medicine, University of Pittsburgh, Pittsburgh, Pennsylvania; Ms. Krueger is Programmatic Nurse Specialist, Medicine and Geriatrics, and Ms. Bourdon is Programmatic Nurse Specialist, Medicine and Psychiatry, Department of Medicine, University of Pittsburgh Medical Center, Pittsburgh, Pennsylvania; and Dr. Palmer is John Franklin Chair of Geriatrics, Department of Internal Medicine, Eastern Virginia Medical School, Norfolk, Virginia. The authors thank Mary George, RN, MSN, CEN, for helping create and format the Wandering Risk Assessment and Intervention Form. Address correspondence to Heena S. Sheth, MD, MPH, Research Assistant Professor, Division of Quality and Safety, Department of Medicine, University of Pittsburgh, 3504 Fifth Avenue, Suite 200, Pittsburgh, PA 15213; e-mail: hss2@pitt.edu. Wandering is a behavioral disorder that is frequently encountered in patients with dementia, other forms of cognitive impairment, and psychiatric syndromes and is defined as the tendency to exhibit persistent walking, elopement behavior, spatial disorientation, or a combination of these problems (Algase, Beattie, Bogue, & Yao, 2001). The Alzheimer’s Association (n.d.) estimates that 60% of patients with dementia will demonstrate wandering behavior at some point. These patients tend to wander when they are disoriented, restless, anxious, agitated, trying to find items or places, or feel the need to complete specific tasks (Algase, 1999). When cognitively impaired patients are hospitalized, their risk of wandering increases because of interacting factors such as the unfamiliar environment, medication effects, presence of acute illness, delirium, psychological stress, and baseline impaired cognitive function (Rowe, 2008). The risk of wandering from hospitals is often not recognized because risk factors in acute care settings differ from those in long-term care settings. 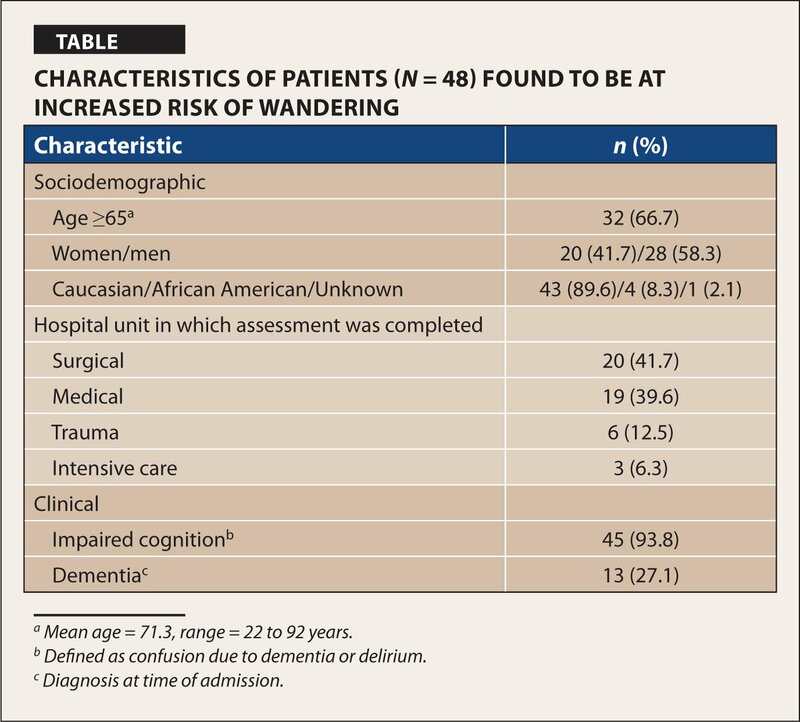 For example, in an acute care setting, the risk of wandering is more likely to be associated with delirium (a common hospital-acquired condition [Inouye, 2006]) in mobile patients (Borbasi, Jones, Lockwood, & Emden, 2006; Godbolt et al., 2004), which also increases the wandering risk associated with dementia or mild cognitive impairment. Acute care hospitals are less likely to have specific safety processes in place, such as limited egress and electronic alarm monitoring found in many nursing home facilities with a dementia unit (Silverstein, Flaherty, & Tobin, 2006; U.S. Department of Veterans Affairs, 2010). Potentially, wandering and the related adverse outcomes could be prevented through a strategy of identifying hospitalized patients at risk, modifying the environmental triggers for these risks, and implementing nursing strategies and standardized protocols to initiate a search process if a patient were to wander from the hospital. Validated tools to screen individuals for the risk of wandering are available for use in long-term care settings such as the Algase Wandering Scale (AWS; Algase et al., 2001), a 39-item instrument, and the revised AWS, a 59-item instrument that is impractical for use in acute care (Song et al., 2003). To our knowledge, there is no validated screening tool to assess the risk of wandering from acute care hospital units. The purpose of this article is to describe the development of a screening instrument designed to identify hospitalized patients at risk of wandering and to inform bedside nurses of interventions to reduce the risk of wandering from the nursing unit. In 2010, a multidisciplinary team was established at a tertiary care teaching hospital in Pittsburgh, Pennsylvania, with 801 licensed beds for surgical and medical patients. The team was led by physicians and hospital administrators and included advanced practice nurses (APNs), RNs, and other health care professionals with expertise in risk management, environmental services, security, safety, and quality assurance. The administrative leadership enabled the team to develop a screening tool and interventions and to implement them throughout the hospital. The initiative was approved by the hospital’s quality council as a quality improvement project. After reviewing the current literature concerning wandering patients, the multidisciplinary team met to discuss which patients should be screened; when screening should take place; who should perform screening; what screening questions would be essential but not burdensome to the screening process; who should train the screeners; what interventions should be initiated for patients at risk; and how the screening information and interventions should be incorporated into current hospital practices. The team determined that all patients older than 18 should be screened for wandering at the time of admission or transfer to a medical, surgical, trauma, or intensive care unit. They should be screened by a bedside nurse after the nurse reviews the patient’s chart and talks with the patient and family. Two questions should be answered by the nurse: (a) Are there any concerns that the patient will wander at the current time? and (b) Does the patient mobilize independently or with minimal assistance AND exhibit cognitive impairment or impaired judgment? If the answer to either question is yes, the patient should be considered at risk for wandering. For at-risk patients, the team developed a list of nine required interventions and seven additional interventions. The hospital has a sophisticated system for electronic health records (EHRs), allowing the screening instrument and interventions to be linked to the system. Obtain the patient’s photograph to post outside the patient’s room and make the photograph accessible via the EHR system if the patient’s location cannot be determined quickly by nurses. Dress the at-risk patient in a bright green hospital gown to serve as a quick visual cue to staff. Update the EHR system’s voice-activated documentation program (Voice Care®) to indicate that the patient is at risk for wandering. Discuss the patient’s risk and the interventions to prevent wandering with the patient and family members. Consult with an expert APN in mental health or geriatrics about the patient’s risk and interventions. Begin hourly rounds for the patient. Set up an appropriate bed alarm system. When the patient must go to another hospital department for testing or other activities, notify the department that the patient is at risk for wandering. Place an anti-wandering device (alarm activated by movement) on the patient. Assign a room that provides a calm environment and enables visibility and frequent monitoring. Store the patient’s clothing in a secure place that is inaccessible to the patient. Review all medications and make changes if necessary. Place a sitter in the patient’s room. The development and evaluation of the wandering screen and associated interventions was part of a larger system-wide process (Condition L [lost]) that uses search and rescue techniques and alerts staff to follow specific, strategically defined roles and protocols. Training of bedside nurses involved a comparison of the expert APN’s risk assessment to the nurse’s screening assessment and interventions using the wandering tool. The Wandering Risk Assessment and Intervention Form (Figure) was created and incorporated in the EHR system. Specific interventions to be considered for patients screening positive were also included in the EHR. Form used to screen for risk of wandering. Without a validated tool (gold standard) for determining a patient’s risk for wandering from an acute care hospital, we defined the criterion standard as the expert opinion of the two APNs. The APNs also provided feedback to the bedside nurse regarding the screening accuracy and the interventions provided to patients. Because the bedside nurses were initially uncertain about implementing the program, the APNs who checked their work found many false-positive screening results. The APNs subsequently concentrated their efforts on educating bedside nurses to screen more accurately and ensuring the appropriate choice and implementation of interventions. After pilot-testing the program, the bedside nurses were asked to screen a consecutive series of adult patients who were admitted or transferred to a medical, surgical, trauma, or intensive care unit of the hospital during a 3-week period in January and February 2010. For each patient, the EHR system automatically displayed the Wandering Risk Assessment and Intervention Form to be completed, and the bedside nurse on duty reviewed the patient chart, talked with the patient and family members, and completed the form. The EHR system automatically generated a daily list of patients who screened positive for wandering. For each at-risk patient on the list, an APN independently reviewed the chart, and if necessary, talked to the bedside nurse, patient, and family. If the patient screened positive for risk of wandering, the APN extracted information from the chart regarding the patient’s age, gender, and race/ethnicity; the hospital unit in which the assessment was completed; and the presence or absence of dementia or impaired cognition. APNs made implicit judgments about accuracy of the screening and the appropriateness of the interventions implemented by bedside nurses. Descriptive statistics were used to report the sociodemographic and clinical characteristics of patients. The proportion of cases in which the bedside nurse and APN agreed regarding patient risk and about what intervention strategies should be implemented are reported. The extent of agreement between bedside nurses and APNs was considered to be an indication of how effective the APNs were in educating the bedside nurses. During the 3 weeks of the study, bedside nurses screened 1,528 patients. Of these patients, 48 (3.1%) screened positive by the bedside nurse for wandering risk. Most at-risk patients were older (66.7%, age ≥65 [mean age = 71.3, range = 22 to 92 years]), had been screened in surgical units (41.7%), and were Caucasian (89.6%) men (58.3%). Among at-risk patients, 13 (27.1%) had dementia and 45 (93.8%) had impaired cognition (Table). The bedside nurses and APNs agreed regarding risk of wandering in 38 (79.2%) of 48 patients who screened positive and about the appropriateness of interventions for 34 (89.5%) of these 38 patients. The APNs believed that two patients required psychiatric consultations, one required psychiatric consultation and allocation of a room closer to the nursing station, and one required sitter supervision. Although 38 patients were classified by both the bedside nurses and APNs as at-risk at the time of admission, 2 (5.3%) patients were determined by the APNs to be no longer at risk at the time of hospital discharge or transfer. Given the large number of admissions during the 3-week study period, it was impractical for the APNs to review data for patients who screened negative for the risk of wandering. However, there were no reported episodes of these patients wandering during their hospitalization. A new screening tool to identify hospitalized patients at risk for wandering was developed by a multidisciplinary team and implemented in a single hospital by bedside nurses with training by APNs. Bedside nurse documentation of wandering risk improved after feedback from the APNs, and the tool was successfully implemented throughout the hospital using an EHR. To our knowledge, this is the first report of an EHR wandering screening tool to be used by bedside nurses throughout a hospital. A convenience sample of patients, who screened positive for wandering, was further assessed by APNs for accuracy and interventions implemented by the bedside nurses. The results suggest that the bedside nurses’ assessment of patients at risk is generally accurate. The APN offered feedback to the bedside nurses that appears to be effective in helping them improve their ability to screen patients and implement interventions designed to prevent wandering by at-risk patients. Tools that are currently available to assess the risk that patients will wander from inpatient facilities (Algase et al., 2001; Song et al., 2003) and interventions that are commonly used to prevent patients from wandering (Altus, Mathews, Xaverius, Engelman, & Nolan, 2000; Hughes & Louw, 2002; McShane et al., 1998; Robinson et al., 2007; Rowe & Bennett, 2003; U.S. Department of Veterans Affairs, 2010) are primarily designed for long-term care facilities and are generally impractical for use in hospital settings. Therefore, in addition to developing a two-question screening tool that bedside nurses can administer quickly and easily to hospitalized patients, we developed lists of required and optional interventions that nurses can institute to prevent wandering of at-risk patients. The new screening tool and interventions are connected with the EHR system, which both prompts and documents their use. The entire initiative to screen for and prevent wandering is consistent with a directive from the U.S. Department of Veterans Affairs (2010). Consistent with published recommendations (Petonito et al., 2013; Robinson et al., 2007; Rowe & Bennett, 2003), our wandering risk assessment incorporates practical interventions, such as implementing hourly rounds. Direct supervision by a sitter might be a consideration in select cases but is impractical for most hospitals with limited resources. Similarly, assigning a room closer to a nursing station can be considered but is not always possible. Physical restraints are not routinely recommended, because they may worsen a patient’s level of agitation and thereby place the patient at risk of injury or distress. Delirium prevention and management can often be accomplished by reducing risk factors such as changing medications or by increasing the hydration and mobility of the patient (Inouye, 2006). Although environmentally based interventions—such as multisensory stimulation (e.g., therapeutic music, aromatherapy, bright light therapy), stress reduction (e.g., exercises), and elimination of environmental triggers of agitation (e.g., excess noise)—are reported to be effective in preventing wandering from long-term care facilities (Robinson et al., 2007), their usefulness in preventing wandering from acute care settings is unknown. Diversionary activities provide a component of multi-sensory intervention and are practical to implement in hospitals; therefore, they were included in our list of additional interventions to be considered in select cases. Further studies are needed to determine whether these activities actually reduce the risk of wandering from hospitals. Our initiative has several limitations that deserve mention. First, because there are no published criteria for identifying patients at risk of wandering, we considered the judgment of our APNs to be the criterion standard. The judgment of APNs may vary from site to site, but we believe this variation could be reduced through training programs such as Nurses Improving Care for Health-System Elders (NICHE; Hartford Institute for Geriatric Nursing, n.d.). Second, a lesson that we learned in pilot-testing our screening tool was that nurses needed more bedside training in the assessment of cognition (delirium and dementia) and mobility (transfers and gait assessments). Hospitals that lack APNs who are able to provide training may wish to consider NICHE training for their geriatric resource nurses. Third, our APNs reviewed the accuracy of screening only in the 3.1% of cases in which patients screened positive for the risk of wandering from a single hospital. Future studies should examine the predictive accuracy of the screening tool in other hospitals and subgroups of patients. Fourth, although our hospital had no incident of a patient wandering during the first year in which our screening tool and interventions were implemented, only a larger and longer-term study can determine the effectiveness of the screening tool and interventions. The Wandering Risk Assessment and Intervention Form is a two-question, EHR-based screening tool that bedside nurses can administer quickly and easily to hospitalized patients. The program also offers EHR-based lists of interventions that bedside nurses can institute for at-risk patients. When we tested these initiatives in a consecutive series of 1,528 patients admitted to the medical, surgical, trauma, and intensive care units at a large hospital, the results suggested that they were helpful in identifying and potentially preventing at-risk patients from wandering. The results also suggested that APNs were effective in improving the ability of bedside nurses to assess and manage patients at risk for wandering. Algase, D.L. (1999). Wandering: A dementia-compromised behavior. Journal of Gerontological Nursing, 25(9), 10–16. Silverstein, N.M., Flaherty, G. & Tobin, T.S. (2006). Dementia and wandering behavior: Concern for the lost elder. New York, NY: Springer. Sheth, H.S., Krueger, D., Bourdon, S. & Palmer, R.M. (2014). A New Tool to Assess Risk of Wandering in Hospitalized Patients. Journal of Gerontological Nursing, 40(3), 28–33. A new screening tool to identify hospitalized patients at risk for wandering was developed by a multidisciplinary team. 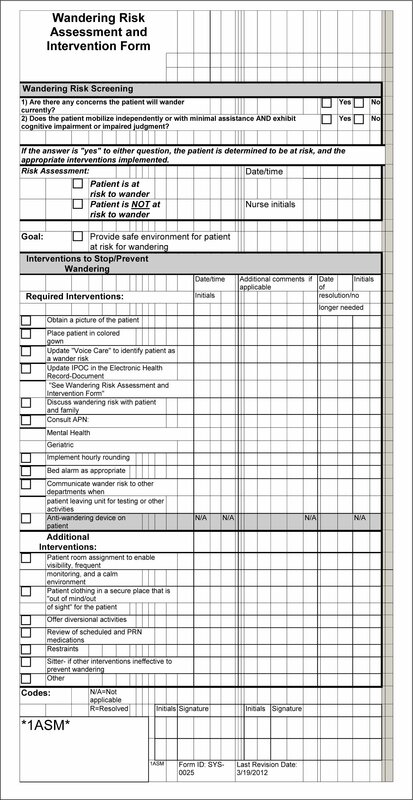 The Wandering Risk Assessment and Intervention Form is a two-question, electronic health record–based screening tool based on cognitive impairment and mobility that bedside nurses can administer quickly and easily to hospitalized patients. The program offers nine interventions along with seven additional interventions that can be instituted for at-risk patients. Advanced practice nurses were consulted regarding the accuracy of screening and the appropriateness of the interventions implemented by bedside nurses, with the majority agreeing with the bedside nurses’ assessments.